Our city, state, region needs the coming restoration of the bike path on the George Washington Bridge to be wide enough to safely support current and future traffic levels. The PA needs to step up to the reality that serious bicycle usage is an issue of our time. We need political will and funding. 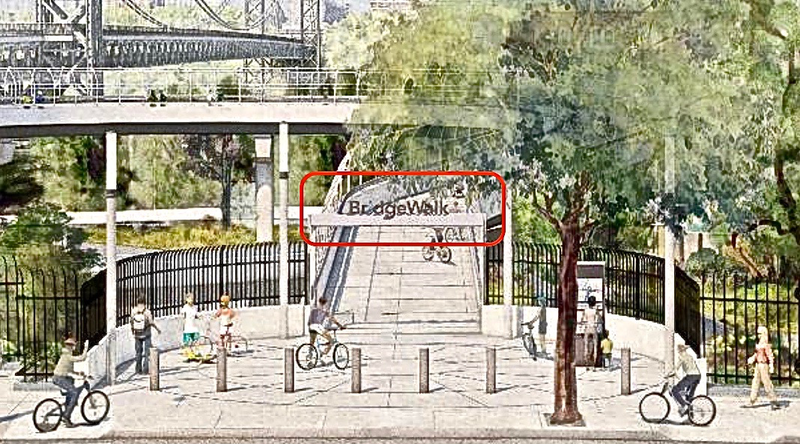 BridgeWalk: While the Port Authority promises adequate capacity for all users, the sign over the cyclists’ path says otherwise. The entrance appears spacious, but the mile-long path quickly narrows to 7 foot. Source, Restoring the George, P. 5. In 2019, another $114 million is being sought to extend the EST across Long Island.2 This is in addition the $440 million spent to put a shared use path across the Mario M. Cuomo Bridge. However, none of these appropriations address the imminent threat to cycling across NYC and the Mid-Hudson posed by the failure of the Port Authority to widen the bike paths on the George Washington Bridge as part of a $1.9 billion restoration. • The GWB is the sole bikeable Hudson crossing out of New York City. It connects to the EST via the Hudson Greenway. • NYC’s 828,000 cyclists represent a huge market for tourism statewide.10 But unless they’re afforded access to roads outside the city, their growth will be limited by local facilities increasingly crowded with pedestrians and runners. Accordingly, we support funding GWB path expansion as an extension of the Empire State Trail.15 The Port Authority may balk at doing the job, but a mandate, and funding, should get it done. Complete George: (2) 10 foot paths for cyclists plus (2) 7 foot paths for peds-runners. 9 foot high safety barriers set below sightlines of walkways. Rendering Joseph Lertola.